Win all of these games! First it was Battlefield 3. Then it was Uncharted 3. Then, Batman Arkham City. 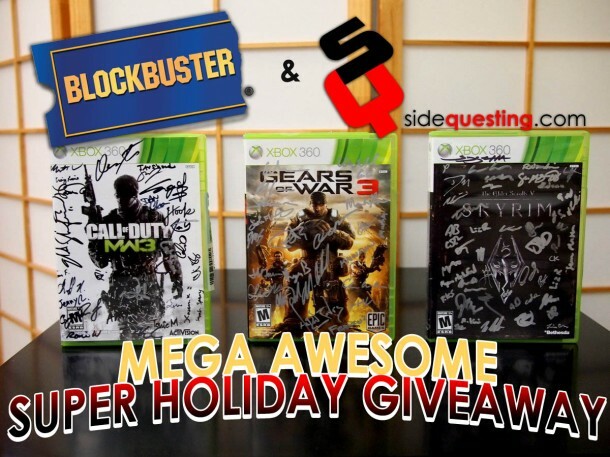 We’ve teamed up with Blockbuster to give away some incredible prizes over the last few weeks. But, it’s now the holidays. You don’t wan’t “just another contest”. You want something with FIRE. You want something to make you forget about the crazy deals that you missed out on because you fell asleep on Black Friday. Blockbuster heard you. They’ve teamed up with us for another awesome contest, but this time, it may be the most epic one yet. You want more awesome? Oh yeah: THEY’RE ALL SIGNED BY THE DEVELOPERS. Yeah, pretty awesome. So why is Blockbuster doing this for you? Because they’ve extended their equally awesome promotion, whereby you order a game from the following list from them and get a full month of rentals of games and movies for free — for new Blockbuster members. Already a member? It’s all good. They’ll give you a $5 gift card in return. But the deal only lasts through to the end of the year, so GET ON IT! So what’s the catch? Well, there isn’t one. But there IS a bonus. Last time we asked you to get 200 entries to activate the prize. You toppled it with over 325! This time, pass 300 entries and we’ll offer up an equally impressive Playstation 3 bundle in the next contest*! All signed copies, all Game-of-the-Year worthy titles! And how do you win? Leave a comment, of course! In your comment, tell us what your favorite Xbox 360 game of this year was. You can enter once per day for SEVEN DAYS, starting today (November 29th, Tuesday) and running through Monday, Dec 5th at 11:59PM EDT Eastern (8:59PM PDT Pacific). Open to US residents only. Special thanks to Blockbuster for providing the games! Please please PLEASE check out their promotion above, which lasts through the end of the year. Every show of support helps us bring you great contests and prizes! Contest starts today (Tuesday, Nov 29th) and running through Monday, Dec 5th at 11:59PM EDT Eastern (8:59PM PDT Pacific). Leave a comment on this post up to once per day, Tuesday through to Monday, for a total of 7 chances to win. Winner selected by SideQuesting on Tuesday morning, December 6th, around 12:00AM EDT. *Note: We’ll still offer a PS3 bundle as our next contest, regardless of how many entries in this one, because we love you.